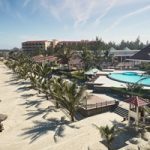 Centara Hotels & Resorts, Thailand’s largest hotel operator, reopened the Centara Sandy Beach Resort Danang following an extensive renovation and upgrade. The resort offers an excellent location on the white sands and clear waters of Non Nuoc beach. The site is designed to offer secluded privacy on a private beach, but is conveniently within 20 minutes of Danang’s airport and downtown, two championship golf courses, and the Hoi An World Heritage site. Its beautiful surroundings, combined with the recent improvements, make this a destination worth considering for vacationing families, couples or friends, as well as weddings or business events. A choice of accommodations includes rooms, villas and bungalows, with up to 92 square meters of living space. The resort’s newly–designed premium rooms and suites feature furnished balconies where guests can enjoy views of the East Sea, forested mountains, and 42 acres of manicured gardens. All 198 rooms are just a few steps away from a swimming pool – one in the gardens, the other at the beachfront. Amenities include Centara’s SPA Cenvaree, a sanctuary set in the tropical gardens that pampers guests with traditional Thai treatments and herbal balms. Centara added two new restaurants, giving the resort a total of five. They range from Ginger & Lime, featuring Thai, Vietnamese and Asian fusion dishes, to the two delightful poolside bars that offer an eclectic array of pizza, gelato, international classics and Vietnamese street food. For weddings and business events, the resort now has two flexible function rooms with seating up to 90, plus outdoor areas popular for large receptions. The garden or beachfront pool areas can accommodate cocktail, banquet or cabaret functions of several hundred guests. The improved resort also offers a library, tour information desk, complimentary shuttle service to Danang and Hoi An, and free wireless internet.